Just because school is back in session and the official end of the season is looming doesn’t mean it’s time to say goodbye to your care-free summer lifestyle. Nope, it’s time to double down with these 11 upcoming events in and around the greater Sacramento-area that we think you should know about. Summer forever! This incredible local artist, whose work you are likely already aware of if you’ve visited Art Hotel, ArtStreet, R Street Block Party or a number of other high-profile local events, has a new solo show up all month at 1810 Gallery. The opening reception on Sept. 1 is free, all-ages, starts at 6 p.m. Info at Facebook.com/1810gallery. Local musician James Cavern’s new label, Tree Tone Records, presents this carefully curated second annual free block party featuring tunes from The Lique, Inland, Soosh*E!, Cameron Calloway, DLRN, The Philharmonik and Wylma. Treetonerecords.com for more. 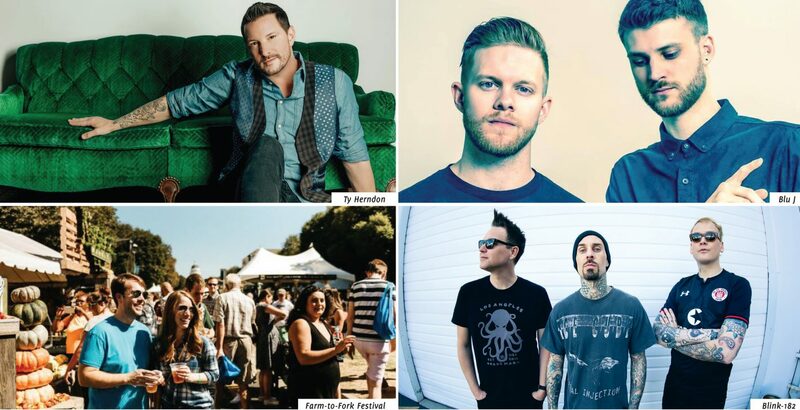 Huge street fair celebrating Sacramento’s LGBTQ community with live music from Ty Herndon (pictured), Erin Bowman, Brandon Stansell and others, plus speakers, guest hosts and special appearances. Runs from 12–7 p.m. Tickets and info at Sacrainbowfest.com. At the Gathering, expect an epic weekend of live music, camping, live art and performances, yoga, guitar workshops and more, all in a beautiful setting less than two hours from Sacramento. More than 30 bands total! Visit Cosmicfamilyproductions.com for more info. Wrap up another epic summer block party series with sounds from two awesome DJ/production duos, BLU J (pictured) and Casino Gold, plus local support from dream-pop band Trophii and DJs Shaun Slaughter and Adam Jay. Free, all-ages event. Facebook.com/thisismid916 for details. Crocker’s fifth annual celebration of comic culture with live music, DJs, local comic book artists, vendors, live character sketching, panel talks, podcasts, a cosplay parade and more. All ages are welcome. 6 p.m. start time, more info at Crockerart.org. A party so big, they call it a festival. The annual #HOFDAY event moves to Old Sac this year and brings with it two stages of hip-hop and dance music from 30-plus DJs and performers, plus food, drinks and all kinds of shenanigans. All-ages event. Hofdayparty.com for full lineup, tickets and more info. Get pummeled for two days straight with more than 20 of the most killer heavy bands from around Northern California and beyond, including Big Business, Spite, These Streets, Armed for Apocalypse, Chrome Ghost and others. Both days are all-ages. Tickets and lineup at Boardwalkrocks.com. This free, family-friendly event features a plethora of food, wine and beer for sale from regional eateries and purveyors, plus a seriously legit lineup of bands, cooking demos, an area for the kiddos, interactive booths and more. Runs from 11 a.m.–6:30 p.m. More info at Farmtofork.com. Doors open at 2 p.m. for this full-on music festival! Major headliners like Blink-182 (pictured), Bleachers, Iration, DREAMCAR and Bishop Briggs join a solid list of locals like Rituals of Mine, Petaluma, The Moans and others. Twenty-plus bands, four stages, one amazing day of music, food, art, beer and friends. Advance general admission tickets are $49.50 at Cityoftrees.com. If horror is your genre of choice, this is the event for you. A weekend of terror featuring full-length films, short films, performance art, burlesque, stand-up comedy, crazy costumes and so much more. Visit Sachorrorfilmfest.com for passes and more event info. For even more ideas of things to do in and around Sacramento, check out our calendar section online HERE.